There are great North Dakota RV camping opportunities. North Dakota RV parks are located throughout the state, and several county, and town campgrounds offer more great public North Dakota RV camping locations. Dispersed camping is available, as well as river access campsites. US Army Corps of Engineers (USACE) has several water containment projects with camping available, and National and State parks offer great RV camping destinations. North Dakota RV Parks – Research tool for finding the best North Dakota RV parks. National Park Service – NPS information about camping on National Park Service administered lands in North Dakota. Great RV camping locations from Carlsbad Caverns National Park to the remote Chaco Canyon Heritage Area. US Forest Service – USFS information about free dispersed camping and developed campgrounds in each National Grassland in North Dakota. Bureau of LandvManagement – BLM information about camping and developed recreation areas in the North Dakota. US Army Corps of Engineers – USACE/COE information about Corps lakesvand campgrounds in North Dakota. US Fish and Wildlife Service – FWS information about National WildlifevRefuges in North Dakota. Not all locations allow RV camping, so check regulations for each NWR. State Parks – Information about camping in the many state parks in North Dakota. State park campgrounds are ideal RV camping destinations. Wildlife Management Areas – Information about North Dakota WMA’s. Many allow RV camping. This 7 page PDF document has all the rules and locations. Boat Launch Areas – Primitive and developed campgrounds along the Missouri River great for RV camping. North Dakota. Includes RV camping suggestions. Camping Reservations – Make your North Dakota campground reservations in advance and your campsite will be waiting for you when you arrive. RVDumps.com – Places to dump in North Dakota. Sanidumps.com – North Dakota RV dumps listed by town. Many county parks have campgrounds ideal for RV camping in North Dakota. To find these parks we recommend an Internet search for – nd county park campground. The following are examples of the many RV camping opportunities available in North Dakota’s county parks. These campgrounds can also be found through the state tourism link above. offers two county park campgrounds with electric hookups and non hookup campsites with a minimal charge. The county also has numerous free primitive campsites perfect for RV camping. 90 RV sites with electric, shower, picnic tables, and fire pits. This county park campground is located 12 miles northwest of the town of LaMoure. Many North Dakota towns offer a municipal park campground. Some are RV friendly with hookups, while many are primitive campsites next to a lake or river. Often the price is free for these primitive campsites. The following are just a few examples of municipal park campgrounds suitable for RV camping in North Dakota. LaMoure – The town web site lists several parks in the area with primitive free RV camping. Adams – The Adams town park offers travelers tent and 2 RV sites with electric, dump station, and a picnic area. RV pads with full hook ups. There is a tenting area, restroom, two picnic shelters, a playground, tennis and basketball courts. 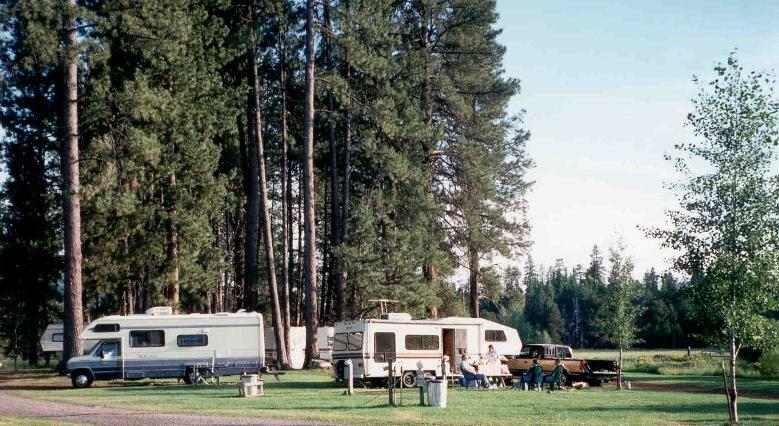 Beulah – Two municipal campgrounds are available that offer RV camping. Buelah Bay Recreation Area offers water, electrical hook-ups, RV dump station and much more. Primitive camping available as well. Edmore – The town park offers 4 electric hookup sites and a dump station, there are tent sites available. North Dakota municipal campgrounds can most easily be found on the North Dakota travel website. A quick tour of their “where to stay” section will allow you to search for campgrounds. You can search by area of the state, or by town, or just view the whole list of over 400 campgrounds. There are numerous free camping opportunities in municipal parks in North Dakota.